Our 2lb and 3lb Medium Yellow Onions are turning PINK from September 1st to November 30th, 2018. Thomas Fresh has collaborated with The Canadian Cancer Society to support breast cancer research. Breast cancer is a cause close to our hearts and we sought to give back to those impacted within Canada, with proceeds from each onion bag sold contributing towards the country’s largest charitable funder of breast cancer research. 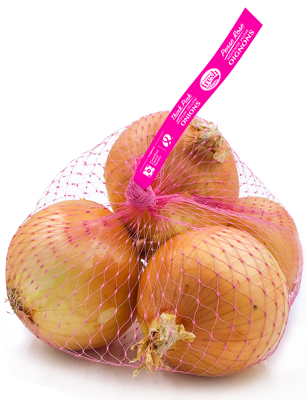 Look for our PINK Onion Bag! Watch for our Think Pink 2 lb and 3 lb Medium Yellow Onions available at Canadian grocery stores from September – November this fall. For each onion package sold, a contribution will be made towards breast cancer research funded by the Canadian Cancer Society. We believe the Think Pink Onion can provide a unique way to remind shoppers, within the produce section of grocery stores and the importance of eating healthy. Our limited edition breast cancer onions were created to support breast cancer research. According to the Canadian Cancer Society, about half of all cancers can be prevented through healthy living and policies that protect the health of Canadians. Eating well begins with eating a variety of foods each day to get the nutrients you need for good health. Yellow onions can be added to virtually any savoury dish, but this flavour-enhancing kitchen staple harnesses a hidden power: onions add a whole lot in the nutrition department and are part of a family known as allium vegetables which include onions, garlic, shallots and leeks. Half a cup of fresh medium yellow onions contain a good source of fibre, vitamin B, vitamin C, folate and antioxidants. Onions are also cholesterol, fat and sodium free. Breast cancer accounts for 25% of all new cases of cancer in females. The 5-year net survival rate for women with breast cancer is 87%. 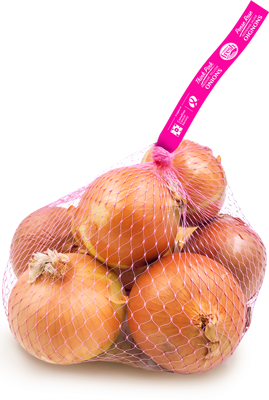 You can find Think Pink Onions at retail stores including Sobeys and Safeway. The Canadian Cancer Society is a national, community-based organization of volunteers whose mission is the eradication of cancer and the enhancement of the quality of life of people living with cancer. The Canadian Cancer Society merged its operations with the Canadian Breast Cancer Foundation in 2017. Check out our full Pinterest page here.